The bicycle beltway is based on existing trails, with hopes to fill in Maryland as part of the Purple Line project, and some additional gaps in Southeast D.C.
WASHINGTON — A new bicycle beltway is set to be endorsed by the region’s Transportation Planning Board in January. The full Outer Loop would be 45 miles long. The beltway would also have additional connections in the middle, through the heart of downtown D.C. along the National Mall, that would bring the total marked trail to about 60 miles long. 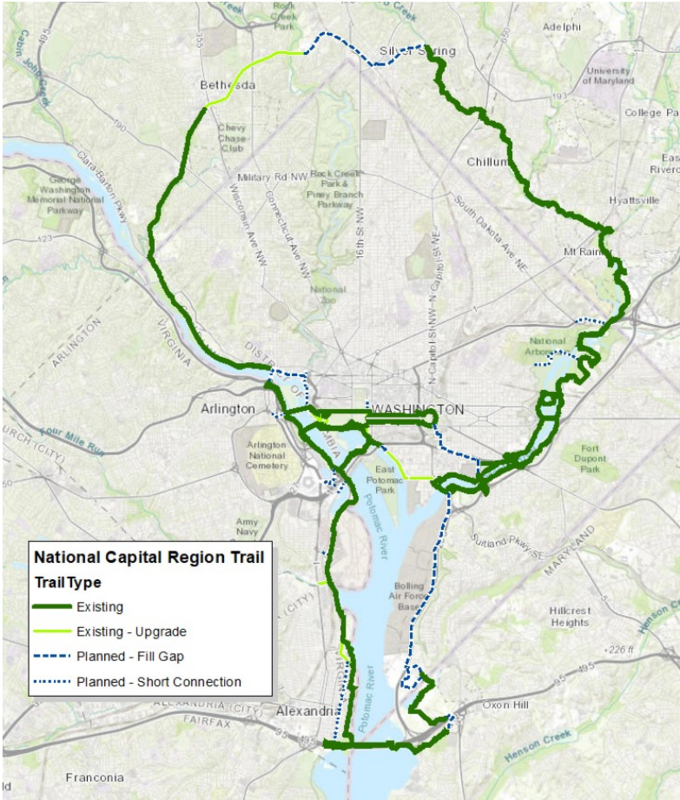 “It is simple, understandable, and refrains from trying to be overly-ambitious or inclusive of all trails in the National Capital Region or broader region,” the Park Service’s Paved Trails Study concluded. “This is the kind of thing where … we have a regional vision for a bike beltway, so now if it’s not in your plans at home, you go back, it’s not the most expensive thing, you help make it work for the region,” outgoing Arlington County Board Member Jay Fisette told his TPB colleagues last week. The plan will be endorsed next month by the Metropolitan Washington Council of Governments’ Transportation Planning Board. The bicycle beltway is based on existing trails, with hopes to fill in Maryland as part of the Purple Line project, and some additional gaps in Southeast D.C., near National Harbor, in the Rosslyn and Pentagon City area, as well as the National Arboretum. About 21 miles of the trail have not yet been built, and three miles of existing trails would get upgrades like widening the paths. “No specific cost estimates are available for unbuilt National Capital Trail projects. They would be expected to range from a number of simple, fairly low-cost improvements, up to the major cost that an Anacostia River bridge would entail,” Transportation Planning Board briefing documents said. While the plan remains aspirational, it is much closer to reality now than when improved connections between existing trails were first formally identified as a significant need back in 1990. “A number of the gaps identified in that plan have since been filled, and the concept of a circumferential loop first proposed in that 1990 plan seems quite achievable today,” the documents said. The loop would include all or parts of the Mount Vernon Trail, Capital Crescent Trail, the trail alongside the Purple Line light rail project, the Anacostia Trail, a planned South Capitol Street Trail in D.C. and the Woodrow Wilson Bridge. In the District, the National Park Service plan calls for a connection from the National Mall to the Anacostia River Trail, and a connection from the Capital Crescent Trail to the Rock Creek Trails and Lincoln Memorial, to avoid putting bikes on the street in Georgetown. Additional or extended bike lanes and trails in D.C. 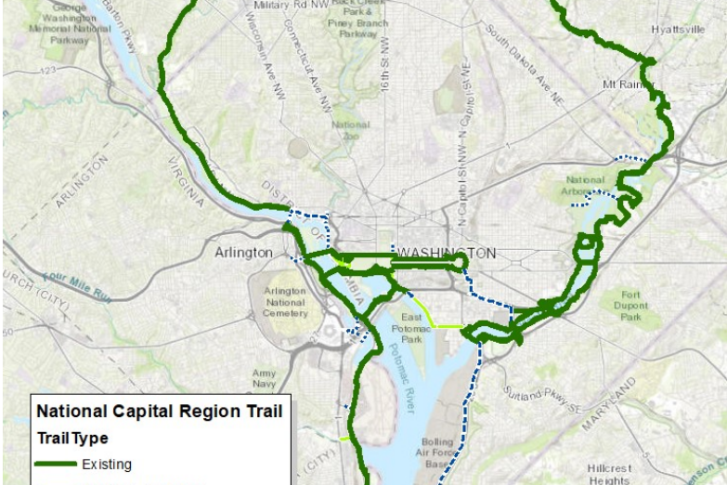 The overall National Capital Trail would include an 18-mile southern loop from the Wilson Bridge through Alexandria, Arlington and downtown D.C., past Joint Base Anacostia Bolling to National Harbor. It would also include a 30-mile northern loop from the National Mall through Bethesda, Silver Spring, Chillum and Hyattsville. There would be seven miles of shorter connector trails meant to make the paths more useful to reach homes, businesses and Metro stations, among other things. More than 1.3 million people are estimated to live within two miles of the trails today, and more than 1.25 million jobs are believed to be within two miles of the trail system. That does not include all of the other major trails that connect to this primary “bicycle beltway,” like Virginia’s Washington and Old Dominion Trail from Purcellville to Arlington, which already functions as a key commuter route. A separate Regional Trails Coalition is working on a plan to more clearly identify, improve and promote those additional routes across the region. The Transportation Planning Board is also set to support improved access to Metro, commuter rail and busy bus stations. “The list of problems is familiar: Sidewalks do not exist or they are in bad condition. Bike lanes are disconnected. Intersections are inhospitable and crossings do not exist. Signage and lighting are poor. These are problems that keep people from walking and biking, even when the distances are relatively short,” the briefing documents said. 62 targeted improvements around selected Metro stations, analyzed in 2016, to expand access on-foot would have cost about $13 million, with an estimated benefit of $24 million in increased ridership and some other reduced costs. Still, more than one in ten daily trips across the area are made by walking or biking, regional planners estimate. That share is projected to grow slightly over the next 20 years. The Transportation Planning Board endorsement of the bicycle beltway and improved access next month does not require the region to move forward on the projects, but is a call for the improvements to happen in the future. Including the projects in long-range plans can also help secure federal funding if local governments and the National Park Service move forward. Similarly, on Dec. 20, the Transportation Planning Board approved five separate long-range planning initiatives pushing for better regional land use, more dedicated bus and streetcar lanes to get people moving more quickly, increased Metro capacity downtown, more HOV or toll lanes across the region, and boosting telework or transit use by raising the cost of parking at work.